Evidence of modern humans older than any ever discovered has been found in Israel – thus the teasing headline. The skeleton’s evolutionary discoverers would certainly discount any Biblical tie-in. Not that Adam was an Israelite, but like some later Biblical prophet, the find seems to be pronouncing doom on modern idolaters from the grave – or, the cave. The alleged date of 400,000 years for the fossils and artifacts – twice the earlier evolutionary estimate for the oldest modern human – is early enough to topple a Darwin statue face down. The fossils found in Qesem Cave in central Israel consisted of modern-looking human teeth and evidences of modern self-awareness and control over nature. PhysOrg announced, “Israeli archaeologists have discovered human remains dating from 400,000 years ago, challenging conventional wisdom that Homo sapiens originated in Africa, the leader of excavations in Israel said on Tuesday.” That out-of-Africa theory has been more than conventional wisdom. It has been downright dogma to paleoanthropologists. Putting modern humans two to four times farther back than previously thought, and in Israel instead of the Olduvai Gorge or Sterkfontein Cave is upsetting, to say the least. Prof. Gopher and Dr. Barkai noted that the findings related to the culture of those who dwelled in the Qesem Cave – including the systematic production of flint blades; the regular use of fire; evidence of hunting, cutting and sharing of animal meat; mining raw materials to produce flint tools from subsurface sources – reinforce the hypothesis that this was, in fact, innovative and pioneering behavior that may correspond with the appearance of modern humans. Finlayson was also bouncing off another shocking story that claimed another branch of early people were in Siberia while Neanderthals were in Europe. Called Denisovans because of the cave that yielded finger bones, DNA and tools, these people supposedly lived prior to 50,000 years ago. Live Science gave prominence to a shocking adverb in this sentence by putting it first: “Bizarrely, the DNA from these extinct Siberians seems unusually similar to that of Pacific Islanders from tropical Melanesia.” Since everyone since Gauguin knows that Europeans are interfertile with Tahitians, this can only mean one thing: evolutionary spin doctors will have to work overtime: “there are already hints that suggest that the status quo will prevail and we will find reasons for making these people a little bit less clever than our direct ancestors,” Finlayson jibbed. Then he jabbed, “The irony is that the scientific community is going to have to come round to the acceptance that the Denisovans and the Neanderthals also belonged to the species which we call Homo sapiens.” So if our Neanderthal brethren were to join a paleoanthropology conference, who would be calling whom stupid? This is a lesson for us [paleoanthropologists] all to learn. But in spite of the evidence there are those who will resist. A hallmark, for the archaeologists, of modern humanity has been the Upper Palaeolithic technology. In recent years the boundary between this technology and its makers has become increasingly diffuse and I would argue that technology can no longer be used as proxy for human taxa. That technological boundary, when the inner lights of the cranium allegedly turned on in the first Man the wise, essentially marks (in their view) a transition from evolving by Darwinian means to mastering intelligent design. Maybe it was a mutation that led to the “appearance” of our kind of biological organism. Whatever it means, it probably coincided with the evolution of humor. Finlayson couldn’t resist sticking this jib in the ribs of his fellow anthropology storytellers (in this case, the Denisovan discovery crew), who put forth a hypothesis that the tools they found in the cave had to have been made by later “real” humans: “In other words the Denisovans lived prior to 50,000 years ago and the tools were made between 30,000 and 23,000 years ago by invisible humans.” Enough to make the cave cookout fire crackle a little louder. Postscript. Speaking of Melanesia and the Pacific islands, a recent paper in the Proceedings of the National Academy of Sciences (see abstract) by Wilmshurst, Hunt, Lipo and Anderson presented a new “high precision” chronology using radiocarbon dating that indicates “recent and rapid initial human colonization of East Polynesia,” centuries more recent than previously believed. They said, “Our empirically based and dramatically shortened chronology for the colonization of East Polynesia resolves longstanding paradoxes and offers a robust explanation for the remarkable uniformity of East Polynesian culture, human biology, and language.” These islands were not settled by humans till beginning 1025 A.D. – remarkable if modern humans had been on earth for 400,000 years, considering that the DNA of the Denisovans resembles that of Melanesians. “Models of human colonization, ecological change and historical linguistics for the region,” they said, “now require substantial revision.” Such revisions might also be in order for theories about human migration in general, considering how quickly humans spread throughout Polynesia once the migrations began. If you thought any more major revisions to the evolutionary story of early man would only make the rubble bounce, you were right. Finlayson should be sticking his jib in his own ribs. 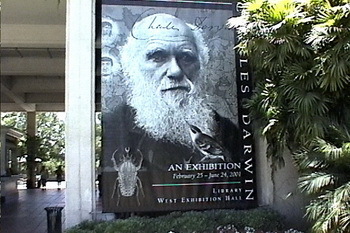 He is still an evolutionist in spite of this devastating series of falsifications to the evolutionary tale. It’s not just his colleagues who are guilty of manufacturing invisible evidence whenever needed to prop up a myth. Notice how he accused scientists of sometimes ensuring the status quo prevails against attacks by the evidence, or coming up with “reasons” for portraying certain groups of people as less clever than we are – a kind of historical racism based on social Darwinist ideology. People fall for this because of the clever ways evolutionists manipulate words and thoughts to lend an aura of “science” to their tall tale telling. It’s like falling for the seductive “missing link” game without realizing that what’s missing is the chain. This latest episode in the parade of paleoanthropology ignorance is brought to you by Creation-Evolution Headlines, to show that evolutionary storytelling is not only misguided and depraved, it’s funny. This is the 610th entry in the “Dumb Ideas” category, meaning that if you peruse back through them all, you can have a wickedly good time grinning at Man the wise trying to figure out where he came from without help from the history book.